LED ceiling lights cover a wide range of luminaires which include suspended (pendant), surface mounted, flush mounted or recessed lights and lighting fixtures. A suspended ceiling light is hung from a ceiling by supports. Surface mounted ceiling lights are mounted directly on walls or on the ceilings. Recessed fixtures are mounted above the ceiling (or behind a wall or other surface) with the opening of the luminaire in level with the surface. Flush mount ceiling lights are mounted flush to the ceiling with little to no gap between the ceiling plane and the light fixture. A semi-flush light extends its base or stem just below the ceiling and leaves a gap between the ceiling and the fixture. Ceiling mounted light fixtures must have a compatibility with the ceiling system. This includes appropriate size, weight, and mounting mechanism. In a typical configuration, a ceiling mount fixture consists of a channel, a channel cover, a light source, a diffuser and end caps. End caps are provided to enclose the ends of the fixture and impart a polished appearance to it. The development in both commercial and residential indoor lighting has been characterized by improvements in illumination quality, energy efficiency together with development in the styling and aesthetic aspects of indoor light fixtures and enclosures. In a conventional ceiling mount fixtures, fluorescent lights are mounted on lamp sockets. Compared to traditional light sources, light emitting diodes (LEDs) have many advantages, which include high luminous efficiency, low power consumption, and long service life. Complement your contemporary decor with LED ceiling mount luminaires which present comfort-inspired style with dependable performance! 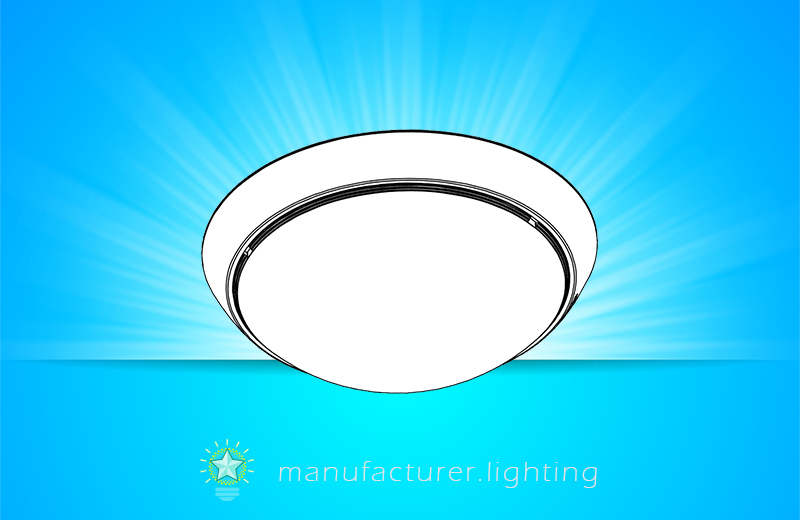 Featuring an energy efficient LED design, LED ceiling light is a great choice for residential and commercial applications. The LED fixture provides exceptional performance for precision lighting applications, while cutting down the energy and maintenance cost when compared to conventional light source. LED ceiling lights give you an abundance of versatile options. Whether illuminating a comfy bathroom or sizeable commercial space, there's always a style and a finish to suit your needs. These fixtures provide adequate illumination to a room covered by the suspended ceiling with aesthetic appeal. Add the elegance of ceiling lighting to your home and office. Contemporary style fixture features a matte white acrylic diffuser and aluminum housing. An etched-glass diffuser creates a feel of movement. Complemented with matching trim in a choice of a brushed nickel or antique bronze finish which comes with a hint of elegance to a room's decor. Utilizing the latest LED, solid state lighting and electronic driver technology for optimal performance and maximized energy efficiency, these highly efficient fixture is perfectly for use in pantries, closets, foyers, hallways, corridors, bedrooms, offices, stairways and utility rooms. LED ceiling lights can be added a variety of features. The color temperature can be adjusted. Built-in light sensor can automatically spots the status of day and night. Automatic standby during the day and activate light at night. A motion sensor allows the light to be turned on on when the people get closed to it. With dimmable driver circuits, these lights are smoothly dimmable down to 10% of full brightness. There are also water-proof LED ceiling lights for wet site application. Moreover, an LED ceiling light integrated with a rechargeable battery can be used for emergency lighting.